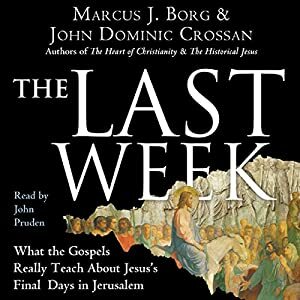 The Last Week brings to light the historical meaning (as Borg and Crossan see it) of the last week of Jesus as told in the Gospel of Mark. This book was very interesting, though lacked the power of The First Christmas, which I reviewed previously. The main reason for this difference is that The First Christmas told the story of Christmas by comparing all the Gospel stories, as opposed to focusing on just one. Borg and Crossan chose to focus on Mark because he’s the only one to have described the entire week in detail. However it made for a much less interesting, and more repetitive, book. Another difference was that in The First Christmas, Borg and Crossan focused a lot on why they thought some passages were parable rather than literal, and why others should be taken literally. The Last Week focused a lot less on this subject, and spent the bulk of the book simply interpreting the historical background of Mark’s Gospel for our modern times. This, of course, is a very interesting subject, but the lack of that added myth vs. literal aspect made for a much less meaty book. All in all, I’d say each of these books has its own merits, and which you read would depend on what you’re looking for. Borg and Crossan are knowledgeable and well-researched historical Jesus scholars. So if you take the Bible quite literally and are looking to understand the historical background of the Passion of Jesus, The Last Week is the book for you. However, if you find the little “inconsistencies” of the Gospels interesting, then The First Christmas is the book for you. If you are at all interested in the subject, I would recommend one or the other (or both) of these books. Great commentary Rachel. As I think you know, I really like analyses of religious books. Too bad that this was not as complex as the earlier work. I agree that historical context is worth delving into, but it is only part of the story. 🙂 Actually, this was the earlier work. Which may be part of the reason it's not so complex.